Bioplastic technology is providing manufacturers with new opportunities to transition into more sustainable products sourced from plants. That's a significant improvement from the current practice, which is to introduce more carbon into the atmosphere by using natural gas or petroleum for plastics. However, the U.S. shale gas boom has sparked new growth in the petrochemical industry, and that growth could hamper overall progress toward a lower carbon footprint. A case in point is a new partnership between three leading companies to bring a new plant-based form of the familiar plastic polyethylene (PE) to the consumer market. In terms of climate change management, bioplastics have a major advantage over conventional petroleum-based plastic: the carbon cycle. Plants sequester carbon from the air, and much of that carbon is re-used when a bioplastic product is recycled. The challenge is to create bioplastics that can meet, or beat, the desirable properties of conventional plastics. Those include durability, flexibility, light weight and low price. A number of high profile manufacturers are racking up success in the bioplastic field, including Coca-Cola and Ford. The Lego Group also seems to be closing in on a sustainable replacement for its iconic plastic construction pieces. The latest development in bioplastic brings together three companies with growing CSR track records. Those are the organic bedding company Naturepedic, the Sealed Air Corporation (developer of an innovative PE foam manufacturing process), and leading global bioplastic feedstock supplier Braskem. The new partnership was unveiled at the Sustainable Brands Conference in Detroit last May. It involves using Braskem's I'm Green PE resin to produce foam for Naturepedic mattresses. Braskem's I'm Green Polyethylene (PE) is a bio-based resin made from ethanol, a renewable and sustainable resource produced from Brazilian sugarcane, and a drop-in substitute for conventional oil-based polyethylene. Cultivation of sugarcane utilizes CO2 and releases O2, which means the material has a negative carbon footprint. Braskem expects that more than three tons of carbon dioxide from its contribution to the partnership will be sequestered for every ton of I'm Green PE foam manufactured by Sealed Air. Naturepedic will be the first company globally to use I'm Green in mattresses. That's fitting, as the partnership's press materials credit Naturepedic with bringing Sealed Air to the attention of Braskem. I firmly believe that making choices with the future in mind is the right, responsible behavior we all should strive for. Using renewable materials decouples us from fossil based plastics, and this is a key tenant of our company's purpose. The new partnership is an important step for Naturepedic, which can now claim to "virtually eliminate" petrochemicals from its entire product line. Aside from high end mattresses, the partnership could help help bioplastics compete with conventional plastics in mid or low cost consumer markets. 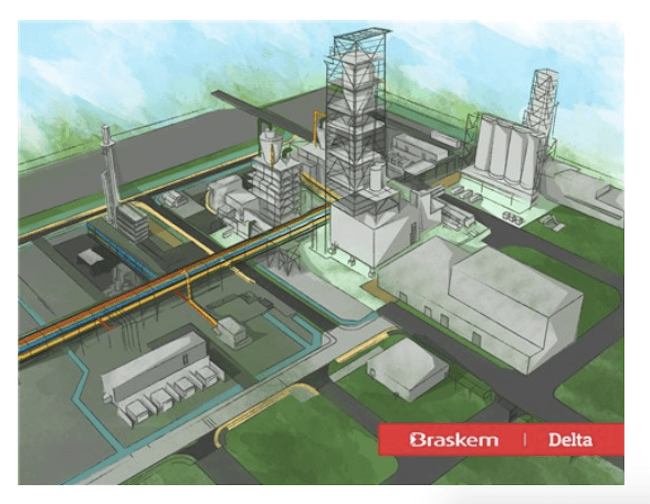 Considering the relatively low cost of natural gas and petroleum that's going to require a new generation of low cost, high quality bioplastic feedstocks, and another Braskem partnership provides a hint in that direction. Last fall, Braskem made news by partnering its green plastics formula with a company called Made in Space. Made in Space is described as the "leading developer of zero gravity 3D printers and an official supplier to NASA." The company's 3D printing technology is is poised to play a crucial role as NASA formulates strategies for long term, self-sustaining space missions (including a Mars landing!). As a renewable and recyclable material, bioplastic dovetails nicely with 3-D printing and the NASA self-sustainability goal. Made in Space already has a location on the International Space Station and its first Braskem-sourced bioplastic printed product is, appropriately enough, a connector for a pipe irrigation system for growing vegetables. The takeaway from that partnership is that niche clients like the federal government (aka, we taxpayers) can motivate companies like Braskem to continue innovating, even if the technology is too pricey for the mass market. With the involvement of NASA, the eventual payoff for consumers could be enormous. NASA is the same federal agency that helped sustain innovation in the U.S. solar industry for more than half a century, until researchers finally began finding the keys to manufacturing low cost solar cells at high volume. Sealed Air is also poised for a new generation of sustainability breakthroughs. The company was founded in 1960 upon the invention of Bubble Wrap and in recent years it has leveraged its in-house laboratory network to integrate bio-based materials in its product lines. Hopefully it won't take half a century for low cost plant based materials to begin making a serious dent in the plastics market. For the near term, though, petrochemicals are gaining the upper hand. Low oil prices are continuing to make it difficult for bioplastics to compete, and the U.S. shale gas boom has also emerged as a competitive force in the global market. That trend is especially apparent in Texas, where bioplastics manufacturers have ready access to land based pipelines and global shipping routes. ExxonMobil, for example, has partnered with Saudi Arabia's SABIC to build a new petrochemical facility they're calling the world's largest ethane cracker, in the area of Corpus Christi. Another example is Braskem. On June 22 the company announced that it has approved construction of a new petrochemical facility named Delta, described as "the largest polypropylene (PP) production line in the Americas," in La Porte. Leveraging the success of shale gas energy production, North America has among the most attractive feedstock profiles worldwide in terms of access to low cost sources of feedstock and the depth of suppliers. In other words, local communities anticipating or actively dealing with the public health impacts of oil and gas operations will not see much relief even if low cost renewable energy shoves natural gas out of the power generation market. Companies like ExxonMobil and Braskem are already anticipating strong growth globally in the demand for non-energy products such as plastics and other petrochemicals. Considering the issue of fugitive methane emissions from drilling operations, the new petrochemical facilities call into question the ability of the plastics industry to claim progress on reducing its carbon footprint overall. One factor that could make a difference is the new U.S. Environmental Protection Agency methane emissions rule. It was formulated under the Obama Administration and has been hung up in court. If the rule is upheld -- and if the Trump Administration decides to enforce it -- that could result in higher prices for petrochemical feedstock, and consequently a more competitive environment for bioplastics. A companion factor is ongoing research by the U.S. Department of Energy leading to sustainable plastics that can compete with petrochemicals, so stay tuned.